We don't show the big guys here. We figure most yardeners can get by on the electric jobs; I've tried all these and they do a job if you have normal sidewalks and driveway. Clear steps, walkways, decks, and small driveways quickly and efficiently with the Toro Power Shovel Electric Snow Thrower. Compact and ultra-lightweight, yet powerful enough to toss snow a distance of 20 feet, this machine is easy to operate and maintain. And with no gas or oil to burn through, it's a practical, eco-friendly choice. Can toss snow 20 feet. Is eco-friendly by using electricity instead of gas or oil. Has a snow removal capacity of 300 pounds per minute. 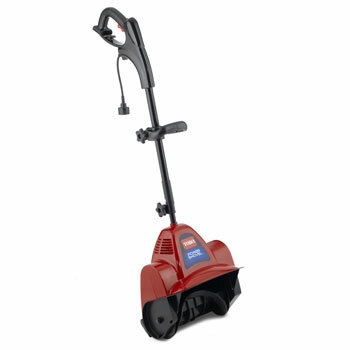 With a 7.5 Amp motor, you'll clean snow off your yard quickly. View larger. Avoid sore backs caused by shoveling and time wasted taking care of huge, complicated snow blowers. This compact electric shovel employs a streamlined auger drive system, which uses a single rotor with two curved blades to quickly and effectively move snow out of your way. With a snow-throwing capacity of 300 pounds per minute, you can clear four inches of snow off a 50-by-20-foot driveway in just 20 minutes. With a clearing width of 12 inches and a snow cut depth of six inches per pass, this Power Shovel will let you clean off walkways with a couple quick passes. And weighing in at just 13 pounds, this snow thrower can be lifted, turned, and twisted with ease. With no gas or oil to burn through, no spark plugs to change, and no time-consuming tune-ups, this electric snow thrower is a cost-effective, eco-friendly option. Its ultra-compact size makes it easier to maneuver than big, gas-powered units, and it's easier to store, too. Exceptional ease of handling makes the small, versatile Toro Power Shovel ideal for spaces like balconies, decks, and staircases. When you do want to clear a larger area, you'll appreciate the surprisingly powerful nature of this lightweight machine. It features a series-wound 7.5 Amp motor, which is designed to produce high torque at lower speeds, making it a perfect choice for snow-throwing. The cord lock system eliminates one of the potential downfalls of using electric products by ensuring your extension cord is reliably locked in place. And with electric power, this snow thrower is easy to start up, even on the coldest days, so you'll never have to worry about the frustration of dealing with a pull cord. The shovel has an adjustable handle. 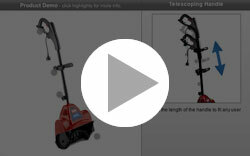 A telescoping handle lets you adjust this snow thrower to fit your height. The height and angle of the operating handle are adjustable too, so you can truly customize the way this tool fits in your hands. This snow thrower is backed by a full two-year warranty. Snow blower and operators manual.